The Regent Street Motorshow 2017 takes place on Saturday, 4th November, the day before the famous Bonhams London to Brighton Veteran Car Run. This free to attend event takes place on one of Europe’s busiest shopping streets. For one day, Regent Street is closed to traffic and filled with cars from motoring’s past, present and future. The first Regent Street Motor Show was staged in 2005 and it has become a hugely popular. In 2016, more than 400,000 people visited the show. Regent St Motorshow 2017 – What’s on? There’s a huge range of cars at Regent Street Motorshow. Cars from the dawn of motoring rub shoulders with the latest, technically advanced, zero emission electric vehicles. Taking centre stage along Regent Street are one hundred veteran cars. Before taking part in the London to Brighton run on the 5th November, the cars take part in the International Concours d’Elegance. Many of the drivers and passengers will be with their cars, dressed in period costume. 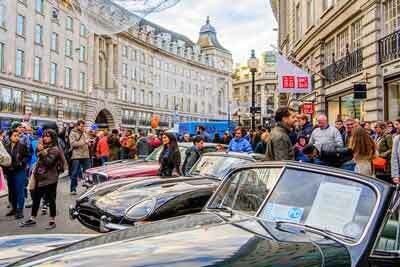 Several one-make car clubs take part in Regent Street Motorshow. Last year one of the clubs taking part was the Jaguar Drivers Club. The club had an array of Jaguar sports cars through the years on display, from the XK140, E-type to the rare XJ220 and the modern F-type. There promises to be something for everyone. With motorcycle displays, a stunt motorcycle team, dance troupes and simulator drives. Regent Street Motorshow 2017 takes place on the world-famous Regent Street on Saturday 4th November. It is a free to attend, no-ticket event. 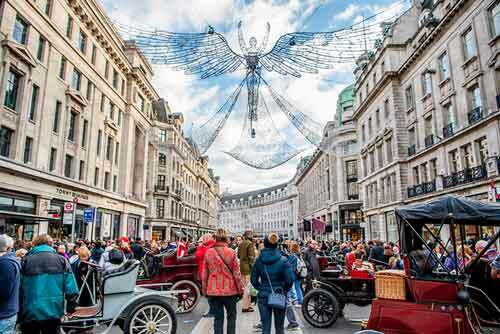 Both the Regent Street Motor Show and the Veteran Car Run are key events in the week-long London Motor Week organised by the Royal Automobile Club.